Poncho's are still trending this fall, and that really surprises me! But I'm happy to get more use out of the two ponchos I have purchased in past seasons. 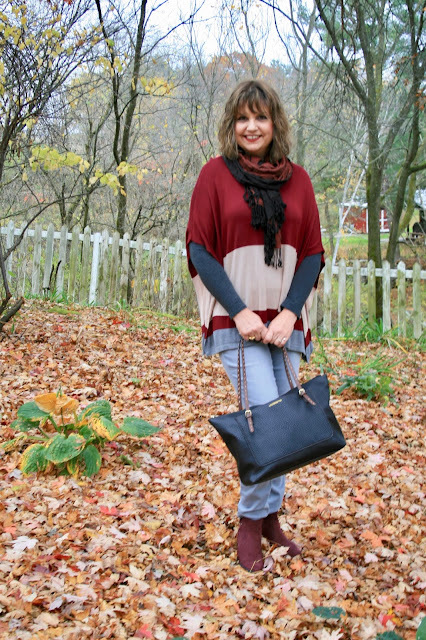 The poncho I am wearing for today's post I received from Stitch Fix two years ago! This poncho is actually sewn a bit on the sides, so it has two arm holes. 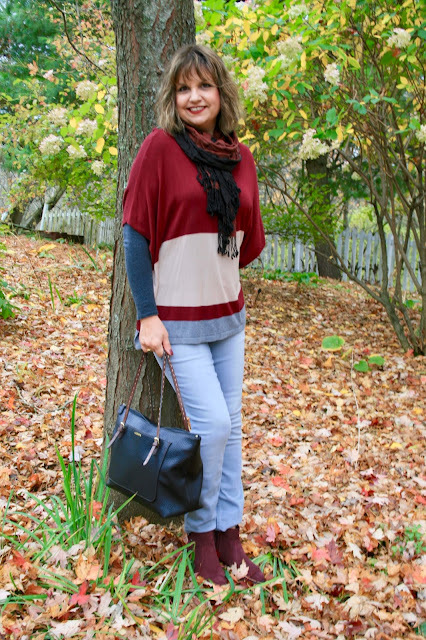 I styled it with grey jeans, a long sleeve grey tee shirt under the poncho, a black and rust scarf, black bag, and burgundy booties. I love the colors in this poncho and the wide horizontal stripes. 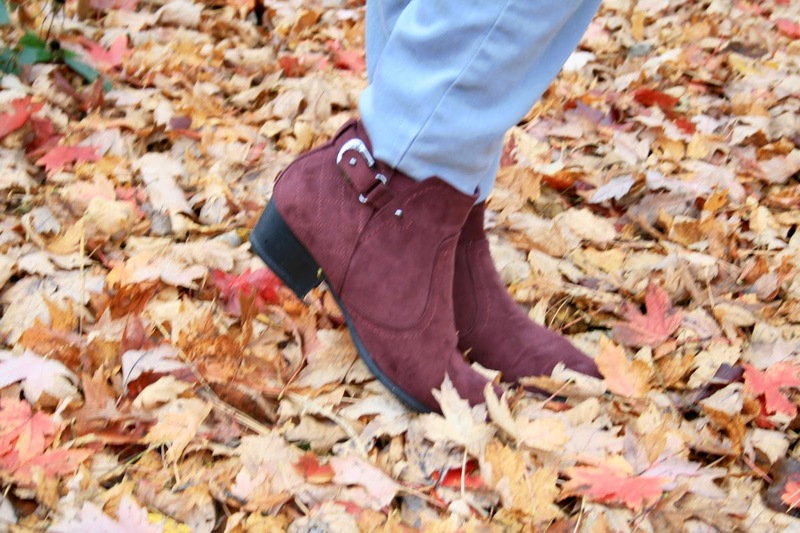 My Unisa Piera Burgundy Booties are from DSW. 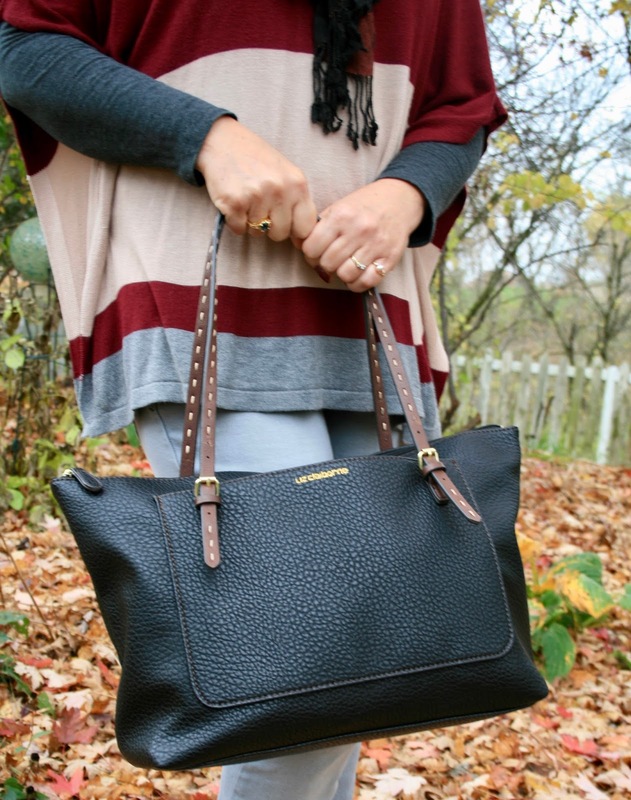 I carried my Liz Claiborne Elizabeth Tote from JCPenney. The last time I wore this poncho I wore it with a necklace and it caused piling on the fabric. So this time, I wore a scarf rather than jewelry. Also, the boat neckline on the poncho is too cool for this time of year, so I needed the scarf. My jeans are also by Liz Claiborne (old). 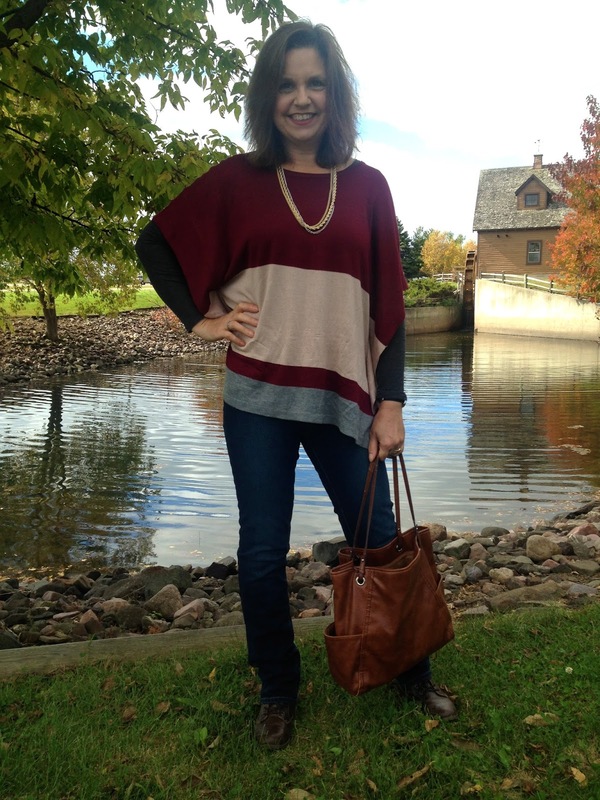 Here is an earlier post from two years ago where I styled the poncho with a necklace, blue jeans, and brown boots. I think I have the same grey tee shirt underneath the poncho. Thank you! Burgundy is one of my favorite colors to wear for fall. Dressing to compliment your beautiful surroundings again, Amy! Nice mix of colours. I haven't quite got into ponchos but spookily I grabbed one in the the last few days to give it a Last Chance because I want to start loving it. Wishing you a happy week ahead, hugs, x.
haha! I think it's only coincidental that I'm color coordinated with nature, but it's a nice coincidence! I'm honestly not a huge poncho fan either. I don't think they are very practical in my climate as there is only a short window we can even wear them here in Wisconsin. That is why I only bought two and no more! Thanks Elli! The fence is still up (although have of it fell over in the flood last year). My husband never had the time to fix it because our septic system broke and then our water heater broke, plus he had to put a new roof on the house. Whew! I'm exhausted just saying all that. Anyway, hopefully next year we can figure out what to do about that fence. As of now, no definite decisions have been made. Such a pretty poncho! Stitch fix has been nailing it. And I do love those burgundy booties of yours! This poncho is SUPER cute! You look amazing in it! I love this poncho Amy!!! What a great way to stay warm and be stylish!! What a cute fall outfit! I love your poncho! This is such a cute poncho! The colors in it are absolutely perfect for Fall, and look so good on you! 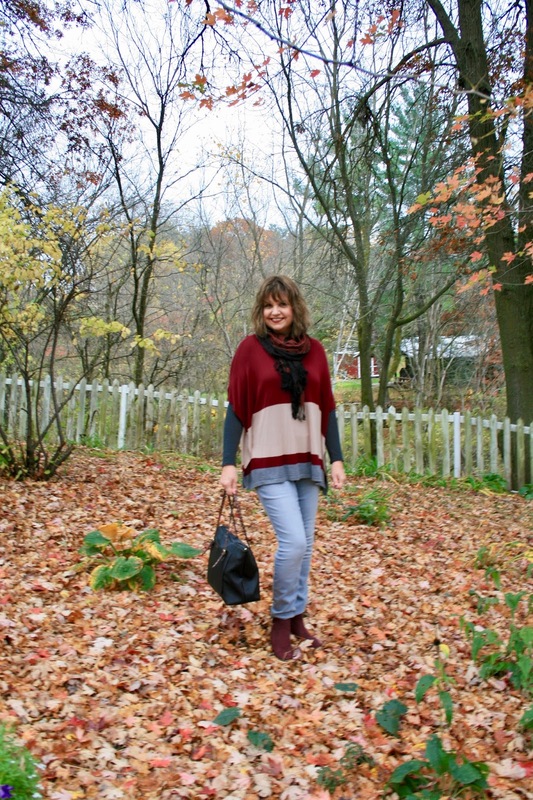 I definitely need to get a poncho after reading this! Thanks Sheree! I'm surprised you don't have a poncho already! You're always so on top of all the trends! Hi Amy! I am loving all of the layers! Your poncho looks great on you, burgundy is one of my fav shades and it looks so fun with the burgundy booties. Beautiful poncho! I prefer them to be sewn at the sides as it helps to keep them in place. Lovely boots too! Thanks for linking up!